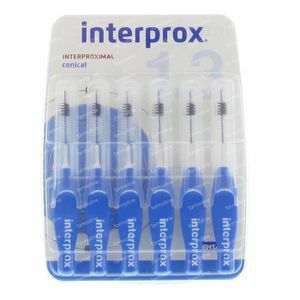 Interprox Premium Brush Interdentale Conical Blue 3,5-6 mm 6 pieces order online. Interprox® Cónico is designed to remove oral biofilm (bacterial plaque) build-up from 1.3 mm* interproximal spaces, particularly in the anterior area of the mouth. Its shape makes it easy to enter anterior interdental spaces perpendicularly, preventing harm to gums. The cap attaches perfectly to the handle, elongating it to reach even the back-most areas of the mouth. Because its handle is flexible, it can be moulded to maintain perpendicular entry in these areas as well. The size of its head are good for cleaning interdental spaces of at least 1.3 mm (PHD=1.3)*. Innovative manufacturing with high quality Tynex® filaments allows for better gum care, because their dual colour design allows white filaments to detect bleeding sites and black filaments to detect the presence of oral biofilm. The stainless steel wire is coated with polyurethane (plastic material), to better protect the mucosal, dental and implant structures. The brush also has a protective cap that allows it to be taken anywhere comfortably. Interprox® Cónico effectively cleans interproximal spaces and helps to protect teeth from caries and periodontal disease. Interprox® Cónico meets the ISO 16409 standard (international standard for interdental brushes). 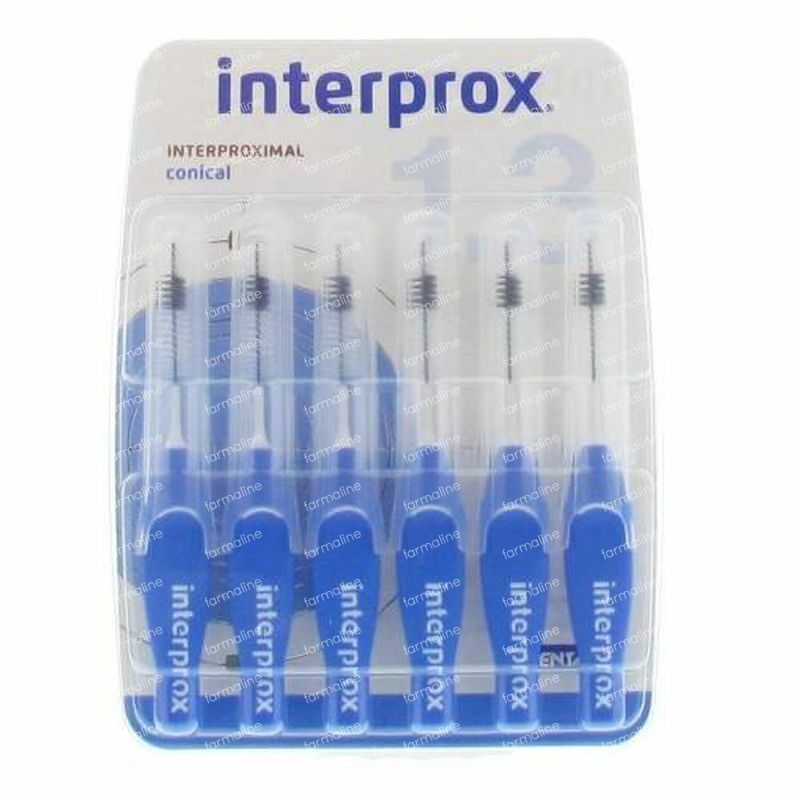 Interprox® Cónico is indicated for people with 1.3 mm* interdental spaces. It is also indicated for people with orthodontics, implants and fixed prostheses. Consult with your dentist to find out the size of your interproximal space and which brush you should use. Insert the brush loosely, so that the filaments, and not the wire, are what are touching teeth. Move the brush in and out, without turning it. The handle can be bent to form the best angle. If the wire bends or rubs gums, use a brush with a smaller PHD.